This poster was created for the Qwertee teeshirt contest. This website is one of the most popular fan-art teeshirt selling site along Red Bubble and Tee Fury. Every day a few designs are chosen amongst thousands to be put up for vote, and then send to print based on a selection processed mixed of popularity and Qwertee art-room selection. When ‘When The Leader We Deserve’ was put on sale, it ranked in the top 10 sales ever made on the website. 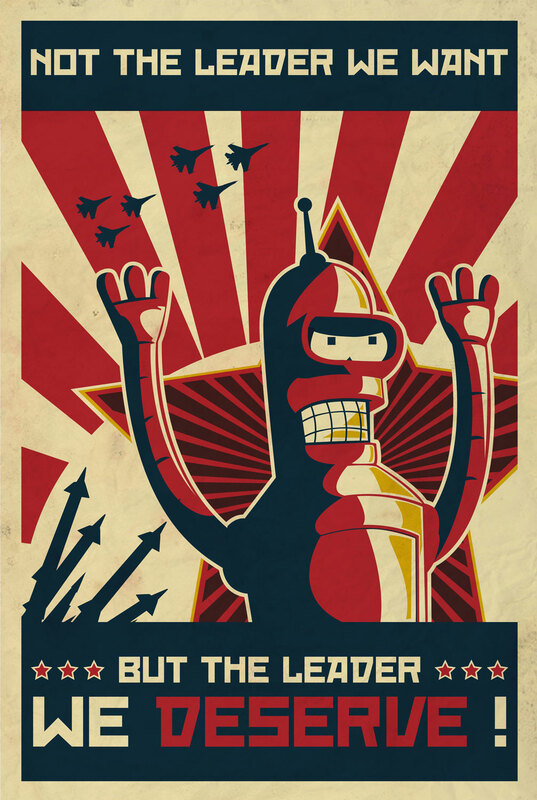 It has been put for reprint 4 times and since, until Fox Entertainment issued a cease and desist, claiming ownership of the Bender character from series Futurama. It has been plagiarised many times since, unfortunately Qwertee and Red Bubble refuse to acknowledge that fact.